South entrance (main) to the Utah State Capitol, with U.S. and Utah flags flying on the single flag poll, and the snow-dusted Wasatch Mountains in the background. Utah State Law Library photo. Utah joined the Union on January 4, 1896. It had been a 49-year slog to statehood for Deseret, the Mormon settlement in the Desert. The size had been pared down, so it would not be the biggest state, incorporating parts of what is now Nevada, Arizona, Oregon, Idaho, Colorado and New Mexico. New capitals had been tried and cast aside (Fillmore, Utah). Democratic Party rule was broken when LDS church authorities went door-to-door, calling every other family to the Republican Party, and party parity. The Mormon Church abandoned polygamy, and adopted a state constitution that gave the vote to women. Finally, Utah became the 45th state. 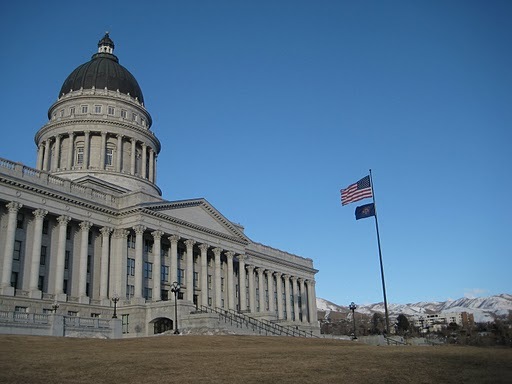 You may fly your U.S. flag today for Utah statehood, especially if you’re in Utah. Happy birthday, Utah! 118 years old today. Much of this material appeared here before; this is an annual event, after all. 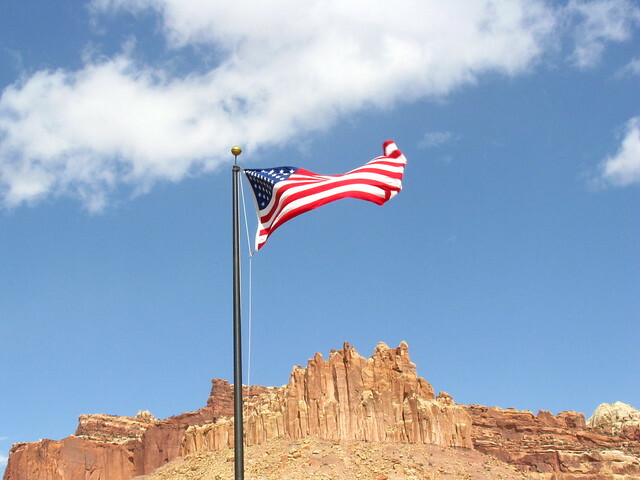 This entry was posted on Saturday, January 4th, 2014 at 11:38 am and is filed under Flag etiquette, Fly your flag today, History, Statehood, Utah. You can follow any responses to this entry through the RSS 2.0 feed. You can leave a response, or trackback from your own site.